501, HUBCAP USED, 13", 95, DODGE, NEON, SPARKLE SILVER, 10 SLANTED SPOKES, 10 TEAR DROP POCKETS. NO LOGO, PLASTIC CLIPS & WIRE RING. 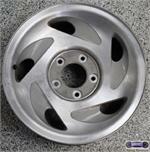 57573, Hubcap used, 14", 04-05, MITSUBISHI, LANCERS, SPARKLE SILVER, 6 SPOKE. RAISED LOGO IN CENTER & TEAR DROP AT TOP OF EACH SPOKE, PLASTIC CLIPS & WIRE RING. 6001c, Used Rims, 15X7, 5 LUG, 4-3/4", 93-94, OLDS, BRAVADA. ALUM, MACHINED FINISH, 6 GOLD POCKETS. TEAR DROP STYLE. 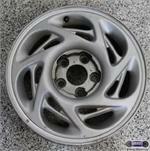 60517a, HUBCAP USED, 13", 91-92, SUBARU, JUSTY, SILVER, 8 TEAR DROPS, PLASTIC CLIPS & WIRE RING.